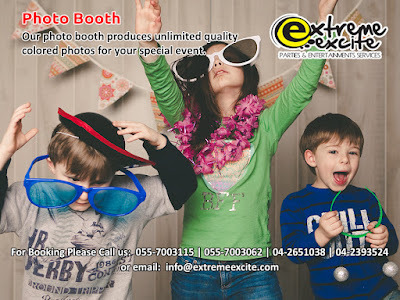 #Extreme_Excite photo booth produces unlimited quality colored photos for your special event. Your guests will just be wearing different props, make a wacky post with costumes and comes out your nice photos. We also provide Professional Photographer and Videographer to capture the memories of your special occasions. Get in touch with Extreme Excite , we will be happy to serve you at all times!